The majestic, deep-water sailing ships of the late 19th century must rate among man's most graceful creations. Under full canvas, large, square-rigged ships have often been likened to ethereal Gothic cathedrals with their lofty spires and flying buttresses. Yet for all their beauty, they were also superb pieces of engineering. Designed to transport a wide variety of cargoes around the world, their immensely strong hulls had to be able to withstand some of the fiercest conditions encountered on our planet. The River Clyde, renowned for over 150 years for its leading contribution in developing and building steam powered ships, also produced some of the most advanced and efficient sailing vessels ever built. Ironically, the large, steel-hulled merchant windjammers of the late 19th century reached their zenith of design just as the increased efficiency of the marine steam engine was about to relegate them to history. In one decade alone, 271 of these new breed of sailing ships were built on the Clyde. One, the 3-masted barque, Glenlee, 1613 gross tons, began life in 1896 at the Port Glasgow shipyard of A. Rodger & Co, for the Sterling shipping company of Glasgow. During her career under the Red Ensign, 1896 -1919, this barque circumnavigated the globe four times and negotiated the notorious Cape Horn on no fewer than 15 occasions. Changing owners and names several times, she finally served as Galatea, a sail training ship for the Spanish Navy, until 1969. In 1992 she was purchased by the Clyde Maritime Trust, returning to Scotland in 1993 for restoration at Glasgow's Yorkhill Quay. She is now moored alongside the city's attractive Riverside Museum of Transport. 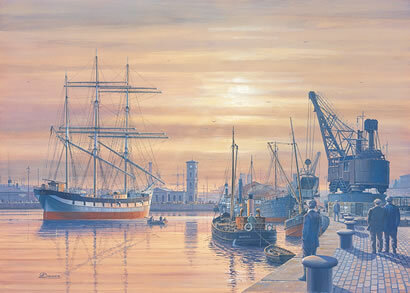 This detailed painting by Gordon Bauwens shows Glenlee as she may have appeared had she visited Queen's Dock in Glasgow early in the 20th century. Sails furled, (bare rigging is beautiful too!) she sits serenely mid-canting basin, having just discharged her cargo of nitrates and surrounded by the bustle of the port. In the background is the still extant pumphouse building with its clock tower, not far from where the fully restored Glenlee is now open to the public as a proud example of a bygone era. This period view, commissioned by one of Glenlee's Trustees, is available as high quality Limited Edition art prints, each, artist-signed with matching Certificates of Authenticity. Produced on heavy 300-gram, acid-free, silk finish art paper, using light-resistant inks, as per most GB Marine Art editions. Limited Edition of 500 Artist-signed and numbered art prints.